Although Bahoriband is renowned as a Jain pilgrimage center in current time but relation to Jainism of this place is not newer but it is hailed from medieval Kalchuri era. Bahoriband is situated in Katni district; 55 kms from Katni district headquarter in south west direction, 90 kms from Damoh in south east direction. The colossal image of Lord Shantinatha is installed and worshiped as principal deity at this place. The town is situated at Kaimoor hillock on the bank of Suhar River. The place was once a major center and the fact is well attested by some paleographic and epicgraphical evidences. It is to be said that there were about 36 Jain temples in Bahoriband. Ancient bricks and pottery were excavated many times which affirms the fact that there were a major settlement of Jains and place has Karchuri era connections. The temple has a mesmeric sculpture of Lord Bahubali Jina which has height of about 4.5 feet and the image is beautifully carved with grey stone and vines are tightly adhering to feet. Lord Bahubali sculpture seems much decorated due to celestial gods, devout and iconographic details of Kalchuri era. The image seems to be hailed from 11-12th century AD. Other sculptures of Yaksh-Yakshi, Meru, Teerthankaras are also preserved at verandah of Digamber Jain temple. Perhaps these sculptures were excavated locally. 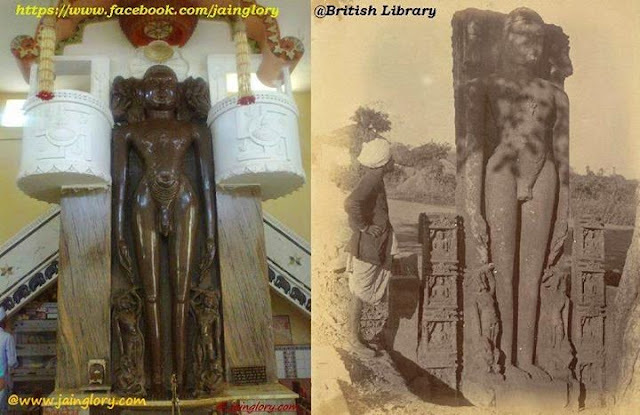 Lord Shantinatha’s colossal image is of grey color has height of 13 feet and breadth of 4 feet. The lord Shantinatha was also worshipped by local people as “Khanua deo”. The image is beautifully carved with tranquility and serenity on face. Shrivtsa sign is engraved on chest of Jina where Deer is engraved on pedestal. An inscription of seven lines is engraved on pedestal of lord Jina which has record that the image of Lord Shantinatha was installed by Mahabhoja son of Sadhu Sarvadhara of Golapurva community. The image was consecrated by Acharya Subhadra of Desiyagna Moolasangha in the aamnaya of Acharya Chandrakara. The inscription is hailed from reign of Kalchuri Gayakarna and the region was governed by Mahasamanta Golhana dev under Rashtrakoot Empire. The place was visited by Alexander Cunninghum and speculated about this image to be hailed from 1022 saka to 1047 saka samvata means 1100 AD to 1125 AD. Thus age of this image should be fixed to 1100-1125 AD under reign of Gaya Karna deva. The name which is locally popular for Shantinatha is “Khanua deo” was also name of Royal prince and son of Gaya Karna deo. Hence, you all should visit the place and famous "Khanua Deo" - the famous lord Shantinatha's image at Bahoriband.